Any small or big business needs improvement. Today it is very difficult to survive in market if you do not opt for continual improvement. 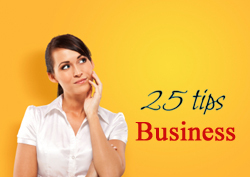 We are here with 25 tips to improve your business. You must set goal for your business, setting target and objective is vital in terms of achieving business success. You should stay organized, start filing and organizing it in correct manner. Eliminate papers that are not required. This will help you to locate important papers. You must plan and schedule your day in advance. By planning day in advance you can set priority and utilize your time in effective manner. You must monitor daily, weekly and monthly cash flow. Monitoring of cash flow will give insight about company financial position. If you are lacking in terms of financial skill you can hire good accountant. You can use value based marketing approach for prospective buyer. Value based marketing is approach for appraising customer & bridging gap between perceived value and actual value of product. It is value cost proposition. Powerful business presentation and communication skills can help you to improve your business multifold. You should master in communication and presentation skills. Motivation can bring performance boost to your team, you should keep motivating your team, this will surely bring benefit to your business. Time management is key to get success today. You should manage your time effectively. In order to manage time well you must make to do list, your to do list must be categorized in short term, medium term and long term projects and work. You should constantly relook and adjust to do list as per need. Product & service innovation is necessary today for business survival. You should constantly innovate for new product and keep sharing new ideas to your staff. You should stay tune and monitor current market trends. Remember no business can operate in a vacuum. Political event, tax change, new rules can affect your business. Every business has certain proven method which are call as best practices you should adopt this best practices while doing business. You should sharpen skill of your team members at regular interval. Especially for sales and marketing team because to improve business it is extremely important to increase sales and generate revenue. You have to start defining priority of your work. Segregate work between less important and most important and target most important work first. Stress is enemy of productivity. You should keep yourself away from stress plan daily exercise or yoga to reduce the stress. Delegate work which can be done by your team member, keep track of delegated work. You have to be visionary about your business. You should able to visualize future of your business & way to reach their. Find Innovative solution of your problems. Remember there are number of way to solve your problems. You have to be passionate about your business. Always try to excel in work you do remember there is no alternative of excellence. Running business is task in itself and if you get tired from continuous hard work, sometime taking break and going on vacation is also best idea to improve your business. Collaboration and networking is key for business success. Spare some time to you’re your partner and customer regularly or keep in touch with them via email and social networks. Health is wealth remember this golden rule. Plan for medical checkup once in year, make sure to exercise regularly and address health related issues which are troubling you. Regularly assess your business situation and take appropriate steps regularly to improve your financial situation and brand position. Remember customer is king in today’s economy. One satisfied customer will bring thousand more customers. Lastly golden rule to grow your business is either more customers or sell more to your existing customers. Improvement in business always helps you to achieve success. Apply these 25 tips to fast track your business. nice all tips for a businessman. I like this post, also improved my self quality.